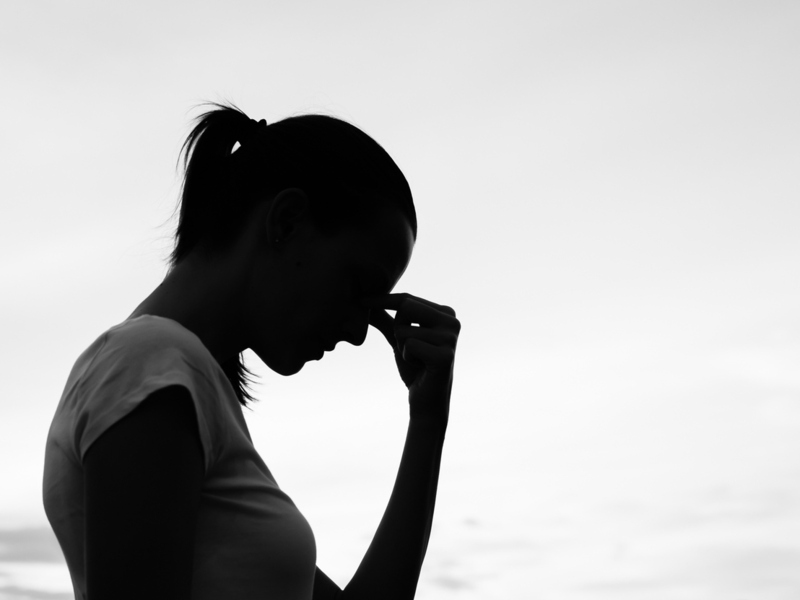 What Is It Like To Suffer From An Anxiety Disorder? : 13.7: Cosmos And Culture Empathy for people diagnosed with an anxiety disorder can come about by reading first-person accounts and by knowing the facts from science, says anthropologist Barbara J. King. Reporter Andrea Petersen's personal reflections are threaded through her account of the science of anxiety and of fresh ways the medical community is devising to help sufferers of anxiety. About 40 million people in the U.S. suffer from some form of anxiety disorder, according to the Anxiety and Depression Association of America. That is a staggering figure. In her book On Edge: A Journey Through Anxiety, published in May, Andrea Petersen, a health reporter at The Wall Street Journal, writes in vivid, memorable detail about what it's like to experience acute anxiety. Petersen recounts a time as a college student in 1989 when she was one day seized by a terrible set of physical symptoms. Her heart rate zoomed, her breathing went shallow, and her vision dimmed. None of it stopped when she got to her home on campus: "I can feel the loud, frantic presence of every organ — liver, intestines, spleen," she wrote. After nearly a year of debilitating symptoms, Petersen was diagnosed with anxiety — a number of varieties, in fact, including panic disorder, generalized anxiety disorder, illness anxiety disorder and phobias around a range of activities from driving on highways to using new tubes of toothpaste. As time went on, Petersen sometimes suffered from ocular migraines and lost part of her vision during them, a situation that naturally didn't help the anxiety. After she moved to New York City, she went to the emergency room at NYU Hospital regularly for a period of time. "It wasn't often that I actually went inside and saw a doctor; I felt safer just being on the sidewalk out front. I could frequently be found skulking around the ER entrance mid-panic attack," she writes. After a decades-long struggle and with the help of cognitive behavioral therapy and medication, Petersen has a handle on her anxiety. From all appearances, she thrives in her life as a wife, mother and reporter. That isn't to say she doesn't have anxiety: She does. She has also been diagnosed with what is called somatic symptom disorder, which "involves distressing physical symptoms and significant worry about them." Petersen worries, too, about a possible genetic inheritance of anxiety by her young daughter and ruefully notes "the march of mental illness across my family tree." This book struck close to home. Anxiety runs through my family too: My mother (who died in 2015) suffered from it, as does my daughter, age 23, who also has been diagnosed with depression and bipolar disorder. When Petersen writes that "anxiety is a thief that steals the present moment," I feel acute empathy for her and for my loved ones whom I have watched coping with precisely that: an inability to revel in the good that is happening right now because of extreme worry about what might happen soon. In fact, Petersen notes, she is pretty good at coping when bad things actually do occur: "Real peril, I found, galvanizes me. I make decisions and get stuff done." I see this in my family too: It's what could come about that is a major focus. Petersen's personal reflections are threaded through On Edge's account of the science of anxiety and of fresh ways the medical community is devising to help sufferers of anxiety. Especially welcome is her on-site reporting from places like the National Institute of Mental Health in Maryland, a program for at-risk preschoolers at Australia's Macquarie University, and her own undergraduate alma mater — the University of Michigan. * Anxiety is "a chronic sense of uneasiness about a vague future, a gnawing worry about what may or may not happen." That sets it apart from fear, which is temporary and concrete. * Anxiety is often rooted in brain functioning: The amygdala of people with anxiety may be hypervigilant even in the absence of threat, and the prefrontal cortex may be comparatively less active in quieting that amygdala-based response than happens in the brains of non-sufferers. * Children who are what is called "behaviorally inhibited" may be at high risk for anxiety, but early intervention programs with families make a difference. The kids themselves practice skills of play and negotiation, and the parents learn which behaviors to praise and which to ignore. "Bravery practice" occurs, essentially CBT for the young set. * Plainly stated, "There is no greater risk factor for anxiety disorders than being born female." Petersen reviews a whole sheaf of reasons for this, ranging from socializing girls to greater empathy to the risk of sexual assault and abuse. * At least according to some studies, anxiety is linked to high intelligence. "It takes a lot of creativity," Petersen writes, "to envision vivid catastrophes and spin doomsday narratives." "One of the most exciting developments I cover in On Edge are these new programs that aim to prevent anxiety disorders in young children. Scientists now understand anxiety disorders to be developmental disorders that begin in childhood. They also are often gateway illnesses: Depression, substance abuse and even suicidal behavior often begin as out-of-control anxiety. Anxiety disorders can also interfere with normal development, sabotaging the acquisition of social skills and achievement in school and in the workplace. "Preventing these disorders from ever occurring could eliminate a lot of misery. The science in this area is still new, but a handful of studies have found these programs to be quite successful. I'm using some of the strategies with my own daughter, who, because of me, of course, has a genetic predisposition to anxiety." What would she like to see changed about this? "There is some exciting work being done with low-cost online cognitive behavioral therapy programs: Some studies have found them to be as effective as in-person therapy. Some colleges and universities are offering these courses to their students and faculty. When I was in Australia, I visited a program that is available to every citizen of that country and includes email support from mental health professionals. "There's also hope that some of the efforts to enhance and speed up the efficacy of CBT and some of the newer treatments being developed that aim to target the underlying neurobiology of anxiety could end up costing less. Attention bias modification, for example, often uses a simple computer game to train anxious people to pay more attention to neutral things in their environment instead of the potentially threatening stimuli they are often drawn to. Reducing this 'attention bias to threat' can ease anxiety symptoms in some people." One of her main goals in writing the book, Petersen said, was "to provide empathy, insight and information to the millions of people who struggle with anxiety, as well as to explain the experience to the people who love them." For this reader, Petersen succeeds. My daughter Sarah's mental health struggles started with her phobias about dogs and insects at about age 3. (Note: Everything I write here about Sarah, I write with her permission.) As a very young child, she did her "therapy homework" with help from my husband and me: to spend calm moments with a family member's gentle old dog, to hold an insect gently captured (and later released) in the bushy area outside her therapist's office. As an older child, Sarah's intrusive worries shifted from animals to tornadoes and gun violence. She contributed her insights to a post I wrote five years ago here at 13.7 about her struggles as a teenager with anxiety and self-harm. As a young adult now, her mental health challenges center o some of the same issues as Petersen's, health and wellness. It has been a long road and, throughout, Sarah has always done brilliantly (I mean award-winningly) in school and at work — but it hasn't been easy. It shouldn't fall to the individual alone to cope with anxiety. Support from family and friends and from excellent, affordable medical professionals is key. Books like Petersen's offer insight and hope.